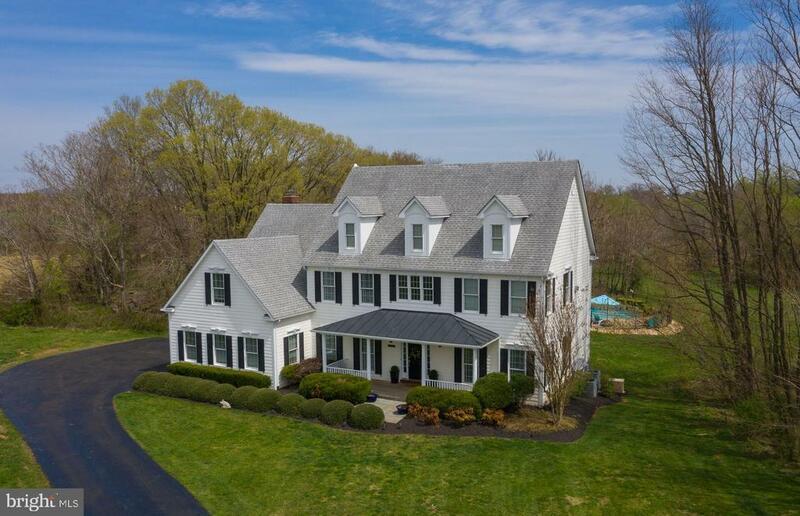 If you are looking for the epitome of the Loudoun County Lifestyle, without having to sacrifice a fantastic house or a great lot, you will find the best of both here. This classically inspired Virginia Colonial is a unique combination of an elegant and inviting home coupled with the best in outdoor living. Nestled in an Equestrian community on 14 horse friendly acres, this Magazine Caliber home could grace the pages of Traditional Home or Southern Living Magazine. A little French Country, a little Modern Farmhouse, this special & unforgettable home works for a full -sized family or one just starting out. Meandering streams, open pastures & a MESMERIZING GUNITE POOL W/ SPA are the back drop for this Custom home built by PRDC (A Renowned Loudoun County Custom Home Builder). From the moment you step inside, you will instantly feel the warmth of the home~s natural light as it shimmers off freshly painted walls (Benjamin Moore~s ~White Diamond~). Wide planked wood floors, upgraded lighting & arched doorways frame each well placed & very comfortable room. There is a traditional front Study w/French door just off the 2-story Foyer & a gracious Living Room w/ charming moldings and columns. The Living Room seamlessly blends into an expansive & very pretty Dining Room, ideal for your special occasions. But it is the rear of the home where you will be TRULY INSPIRED. Here is a fantastic combination of a Stylishly Renovated Kitchen adjoining an Inviting Family Room w/fireplace is paired w/ a sleepy Sun Room. These three rooms come together so effortlessly you will no doubt want to spend your days here. For the Chef, there are furniture style cabinets, subway tile backsplash, top of the line appliances & ample warm granite countertops. And while the chef is at work, guests can sip wine at the awesome spacious center island. The Kitchen also features a true walk in pantry, a built -in wine rack w/wine cooler & an immense eat in area-because the party is always in the kitchen! If the weather is mild, dine in the entertainment scaled Screened-In Porch leading to the outdoors where the real fun begins: Whether swimming in the free form pool with waterfall or enjoying the soothing spa, you will feel on vacation while still at home. Imagine hiking through the rear fields over the 2 streams where wildlife abounds and then circling back to tell stories under the stars by the fire pit. When it~s time to go inside, the WALK-OUT Lower Level is a great place to unwind. Here you will find a spacious Rec Room w/ a new custom bar w/ Wine Fridge & granite counter tops. Head to the awesome Media Room, sink into an enormous custom chair and enjoy the best at home movie experience. The lower level also features the 5th bedroom w/ a full bath (ideal for your guests, au-pair or in- laws), or slide the BARN DOORS to find the exercise/hobby room. On the Upper level, you will find more beautiful wood floors & a Master Bedroom Retreat w/ a cozy fireplace, walk-in closet & peaceful views. Bedrooms 2 & 3 are equally generous w/new custom closets while enormous Bedroom 4 enjoys a private full bath & custom closet. Original Owners have LOVED this property & have kept it in mint condition: Some recent improvements include: New interior paint & exterior trim/dormers, new gutters /downspouts, a full renovation of the pool & spa in 2018, recently replaced HVAC w/ transferable warranty until 2023, newer water softener, custom bedroom closets, wood floors in the majority of home, & an automatic Generac Guardian generator. Just 6 miles North of Historic Leesburg and only minutes to restaurants, vineyards, breweries, boutique shops, an outlet mall and other modern conveniences. Golf, Hiking, Fishing, & Boating on the Potomac River is 10 minutes away & HORSES are everywhere! 15 minutes to The Dulles Greenway/30 mins to Dulles International Airport. 15 minutes to MARC TRAIN & White~s Ferry. Enjoy the Ultimate Country Experience in a truly Unforgettable & Gracious Home!